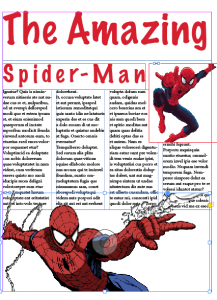 When it’s time to pull your graphics and text together into one document, Adobe InDesign is the place to be. Be it a flyer, poster, brochure, newsletter, magazine or other media, if you need to create layouts with text and images, use InDesign. Yes, Photoshop lets you create text boxes. 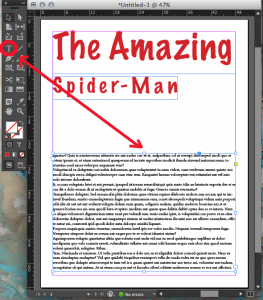 But, comparing Photoshop’s Type tool to InDesign’s layout features is like comparing a house cat to a panther — they share a couple genes but one is clearly beefier. 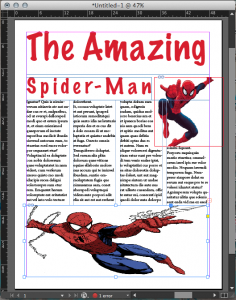 In this experiment we will create a basic document in InDesign, incorporating several boxes of text with images. Along the way we’ll point out some handy tips, and if you like what you see, check out our InDesign classes. We’re only scratching the surface here. 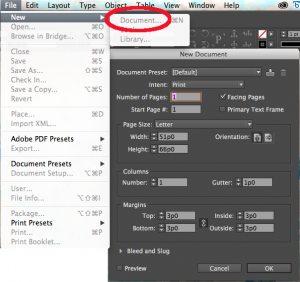 Start off by creating a new doc in InDesign. Go to File > New > Document. You will see other options like new Book or new Library. Ignore those for now. Like any time you’re opening a new document, a window will open where you can set document features such as page count, margins and so on. We’re skipping document features here. There’s plenty to cover as is. 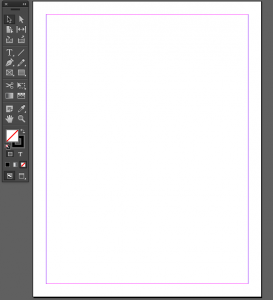 After creating a new InDesign document, you should be staring at a big, blank document. Sometimes getting started can be a little difficult, so if you want you can use the Frame tool to create a blueprint for where you want text and images. With the Frame tool selected, click-drag over your canvas. This creates blue boxes with a big “x” running through them. Here, we used the Frame tool to get a decent idea for the spatial requirements for our headline, sub-headline and text body. The Frame tool doesn’t set anything in stone. Likewise, our final layout hardly resembles the the blueprint. But, that’s okay. As long as you get the ball rolling, the Frame tool did its job. These frames won’t show in a printout or digital copy of your final layout, but if you want to keep your canvas clean you can delete the frames by selecting them using the Select tool and (obviously) clicking Delete on your keyboard. 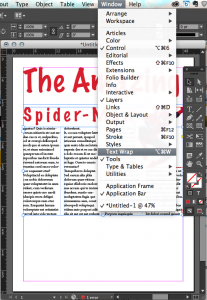 With an idea of what to do, you can now start putting some content on your InDesign page. We started with text. Using the Type tool, we created three text boxes (all in the same layer). 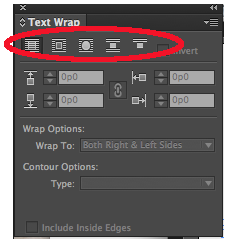 You can create new layers for each text box by clicking the New Layer icon in the Layers panel. But, for a simple design like ours, you may not need to do that. Text boxes can be reshaped at any time, so you don’t have to get your boxes perfect from the start. As you can see from the image above, the headline and sub-headline text are stylized. Specifically, the text has a red fill and a new font. With the Type tool selected in your toolbar, the taskbar atop your document offers a ton of features to customize your text. Now that the headline and sub-head are somewhat set, we can move onto other elements. First, we’ll play with the text body. Breaking up text into columns helps give a layout some structure. It also improves readability–people seem to like information in bite size chunks. So, we’ll create columns for our body. Click on the Select tool (the black pointer) in the toolbar and click on your body of text. You know the text box is selected when you see “handles” (square knobs) on the corners of the box. You will notice that a different toolbar appears over your document. Use the Columns tool (highlighted in the above image) to create multiple columns. Your document should be shaping up quite well at this point! Tip: We used dummy text in our layout, but you can import documents from Microsoft Word and other word processors rather than typing content directly into InDesign. Let’s jazz up our document with some images. For each image you will want to create a new layer. After creating a new layer, go to File > Place and select your image. A thumbnail of your image will replace your mouse; by click-dragging over your canvas you will place that image in your document. Note: If your image accidentally places over another piece of your document, use the Undo function. You cursor should become an image thumbnail at that point. Depending on your image, you may find that you’re having trouble fitting your image into its allotted space. InDesign has you covered. 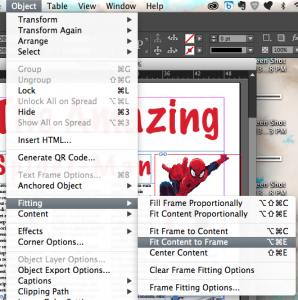 With your image selected, go to Object > Fitting > Fit Content to Frame in the main menu. This will “squish” or “expand” your image to fit in the box. To reposition your image within the box, click-drag the “eye” in the center of your image. Note: If you’re expanding your image, your image may become distorted. You may need to re-arrange layers if images and text overlap. Or, you can do a text wrap. Use the Select tool to highlight the text box that overlaps your image. Then, click Window > Text Wrap in the main toolbar. The popup window lets you pick the style of text wrap you want to implement. In the end, you should have a nice, clean layout. 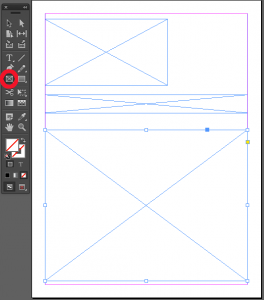 Now that you have the basics of InDesign layouts, you may want to create styles. Styles are certain text characteristics that you can save within InDesign and easily replicate over future projects. This, along with other shortcuts, can make big projects fly by.